In 1967, the U.S. Supreme Court ruled in the Loving v. Virginia case that marriage across racial lines was legal throughout the country. 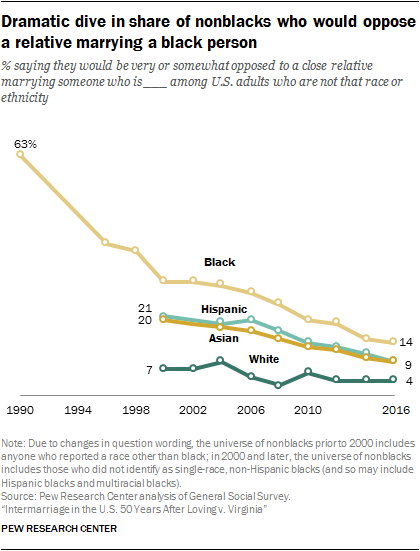 Intermarriage has increased steadily since then: One-in-six U.S. newlyweds (17%) were married to a person of a different race or ethnicity in 2015, a more than fivefold increase from 3% in 1967. 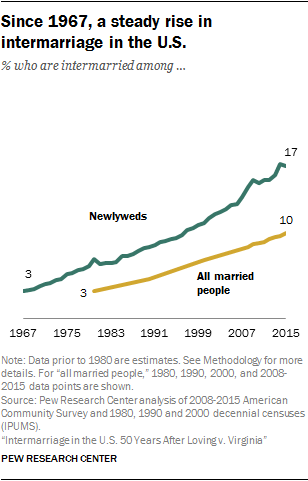 Among all married people in 2015 (not just those who recently wed), 10% are now intermarried – 11 million in total. Here are more key findings from Pew Research Center about interracial and interethnic marriage and families on the 50th anniversary of the landmark Supreme Court decision. 1 A growing share of adults say interracial marriage is generally a good thing for American society. Nearly four-in-ten adults (39%) say the growing number of people marrying someone of a different race is good for society, up from 24% in 2010. Adults younger than 30, those with at least a bachelor’s degree and those who identify as a Democrat or lean Democratic are especially likely to say this. Americans today also are less likely to oppose a close relative marrying someone of a different race or ethnicity. Now, 10% say they would oppose such a marriage in their family, down from 31% in 2000. The biggest decline has occurred among nonblacks: Today, 14% of nonblacks say they would oppose a close relative marrying a black person, down from 63% in 1990. 2 Asian and Hispanic newlyweds are the most likely to be intermarried. 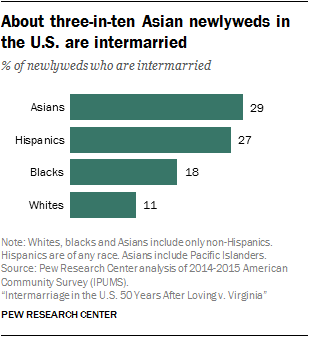 Nearly three-in-ten Asian newlyweds (29%) were married to someone of a different race or ethnicity in 2015, as were 27% of Hispanic newlyweds. Intermarriage for these groups was especially prevalent among the U.S. born: 39% of U.S.-born Hispanics and almost half (46%) of U.S.-born Asian newlyweds were intermarried in 2015. Although Asian and Hispanic newlyweds are most likely to be intermarried, overall increases in intermarriage have been driven in part by rising intermarriage rates among black and white newlyweds. The most dramatic increase has occurred among black newlyweds, whose intermarriage rate more than tripled from 5% in 1980 to 18% in 2015. Among whites, the rate rose from 4% in 1980 to 11% in 2015. 3 The most common racial or ethnic pairing among newlywed intermarried couples is one Hispanic and one white spouse (42%). The next most common intermarriage pairings are one white and one Asian spouse (15%). Some 12% of newlywed intermarried couples include one white and one multiracial spouse, and 11% include one white and one black spouse. 4Newlywed black men are twice as likely as newlywed black women to be intermarried. In 2015, 24% of recently married black men were intermarried, compared with 12% of newly married black women. There are also notable gender differences among Asian newlyweds: Just over one-third (36%) of newlywed Asian women were intermarried in 2015, compared with 21% of recently married Asian men. 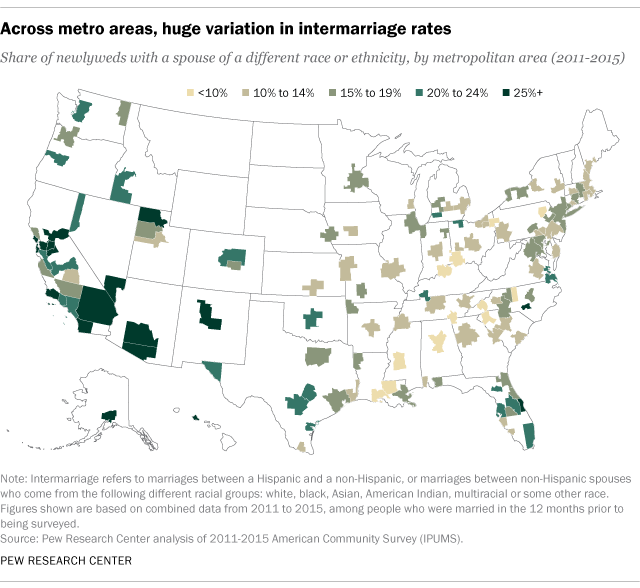 Among white and Hispanic newlyweds, intermarriage rates are similar for men and women. 5Since 1980, an educational gap in intermarriage has begun to emerge. While the rate of intermarriage did not differ significantly by educational attainment in 1980, today there is a modest gap. In 2015, 14% of newlyweds with a high school diploma or less were married to someone of a different race or ethnicity. In contrast, 18% of those with some college experience and 19% of those with a bachelor’s degree or more were intermarried. The educational gap is most striking among Hispanics. Nearly half (46%) of Hispanic newlyweds with a bachelor’s degree were married to someone of a different race or ethnicity in 2015, yet this share drops to 16% for those with a high school diploma or less. 6One-in-seven U.S. infants (14%) are multiracial or multiethnic. This share is nearly triple the share (5%) in 1980. Multiracial or multiethnic infants include children younger than 1 year old who live with two parents and whose parents are each of a different race, those with one Hispanic and one non-Hispanic parent, and those with at least one parent who identifies as multiracial. Among interracial and interethnic infants, the most common racial/ethnic combination for parents is one non-Hispanic white and one Hispanic parent (42%). 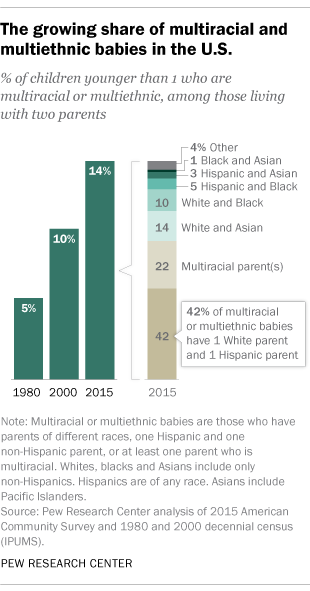 The next largest share of these infants have at least one parent who identifies as multiracial (22%), while 14% have one white and one Asian parent and 10% have one white and one black parent. The share of infants with interracial or interethnic parents also varies considerably across states, from 44% among those in Hawaii to 4% among those in Vermont. 7Honolulu has the highest share of intermarried newlyweds of any major metropolitan area in the U.S. Four-in-ten newlyweds in Honolulu (42%) are married to someone of a different race or ethnicity, followed by newlyweds living in the Las Vegas (31%) and Santa Barbara, California (30%) metro areas. At the same time, just 3% of newlyweds in or around Asheville, North Carolina, and Jackson, Mississippi, are intermarried. Generally, newlyweds living in metropolitan areas are more likely to be intermarried (18%) than those in more rural, non-metro areas (11%).